Firstly we would ask, have you done your research to learn a little about this delightful breed before you think of adopting one? A little knowledge goes a long way and can help you to make those all important decisions. Westies are now more popular than ever and it really is easy to see why when they are used so extensively in advertising, but please do not be misled. They can be single minded with their feisty, stubborn natures and strong independent spirits. Despite the media portrayal and advertisements persuading you that westies would love nothing more than to ride around in a basket on the front of a bicycle, the hard truth is that your little bundle of fluff would probably be happier digging up the garden or chasing the neighbour’s cat. You should know that the westie has a true terrier temperament, is fiercely determined and was bred to hunt. The Kennel Club Breed Standard perfectly describes the Westie as “possessed of no small measure of self-esteem”. The media in general depicting them as pretty little white lap-dogs, does not convey the true character and nature of the breed. Make no mistake…….. dynamite can come in small packages! Why would you like to rescue a Westie? We have found over the years that there are many reasons why people would choose to rescue a Westie rather than go to a reputable Kennel Club Assured Breeder for a puppy. One of those reasons is the myth that it is cheaper! We would like to allay that myth straight away as it is not, at least not in the long term and that is what matters. Taking on the responsibility of rehoming a rescued westie requires both emotional and financial commitment to the dog and their future as part of your family. Some rescue westies have issues when they arrive that can take time and money to overcome, some may have lifelong issues that require continuous care. You may also encounter some behaviour problems with your new friend, at least for a while until he/she feels more secure in their new environment and with you. These problems could include house soiling, even if it was previously out of character. Chewing or other destructive habits, which can be used by the dog as a displacement activity to help it cope with the disruption in its life, could prove rather frustrating and possibly expensive. Then of course there may be vets’ bills, an inevitable part of being a pet owner. If there are behavioural issues then they can usually be addressed very successfully but again the cost of going to a reputable, qualified behaviourist is not cheap. We have no wish to put off any prospective future owners but it is essential that we all know what we are getting into from the start; we must add that after saying all of that, the rewards are huge as the westie is a trusting, loyal and loving friend and companion. Are you bowing to pressure from the children? The appeal and visual attraction of the westie puts it towards the top of a child’s list of wants when it comes to choosing a pet dog. Before long however, in most cases, the novelty begins to wear off. It is common for Westies to live to 14 or 15 years old which means a long term commitment to its care. It is unusual for a child to commit to looking after the dog for its lifetime without leaning rather heavily on a parent or other adult. Of course, rescue dogs have often had a bad experience with children and may have come to us as a result, if this were the case then no matter how well behaved the child may be, the dog could retain this distrust and tend to be on the defensive. Are you motivated by emotion? Please never adopt a dog for emotional reasons alone. This can lead to over-compensating for the dog’s past and no dog likes to be smothered. It rarely happens that the dog will be forever grateful for its change in fate and behave accordingly. A rescue dog needs respect and understanding, communicating in a way that it understands, with canine values. Any new situation may be difficult for a nervous or fearful dog to deal with, and cuddles and kisses can only make it feel more threatened and may cause an adverse reaction. Westie ReHoming, like most other rescues, rarely has ‘the perfect dog’. The majority of requests that we get are for one that is young, healthy and sociable and good with children/cats/other dogs, is well behaved and friendly, not yappy, and can be left all day while the family is out at work/school without tearing your house to shreds. In other words, does everything but make the tea! If this is the kind of dog that you are looking for, then you are being too idealistic, and certain to be disappointed. Please, never rule out taking on an older dog which can be far less demanding, an important consideration if you are older or less active yourself. Like people, some dogs act older than their years and some will act younger, but generally speaking a young Westie is not designed to be a ‘couch potato’ but needs appropriate levels of mental stimulation and exercise to avoid behavioural problems and to delay the onset of those illnesses related to a sedentary lifestyle. 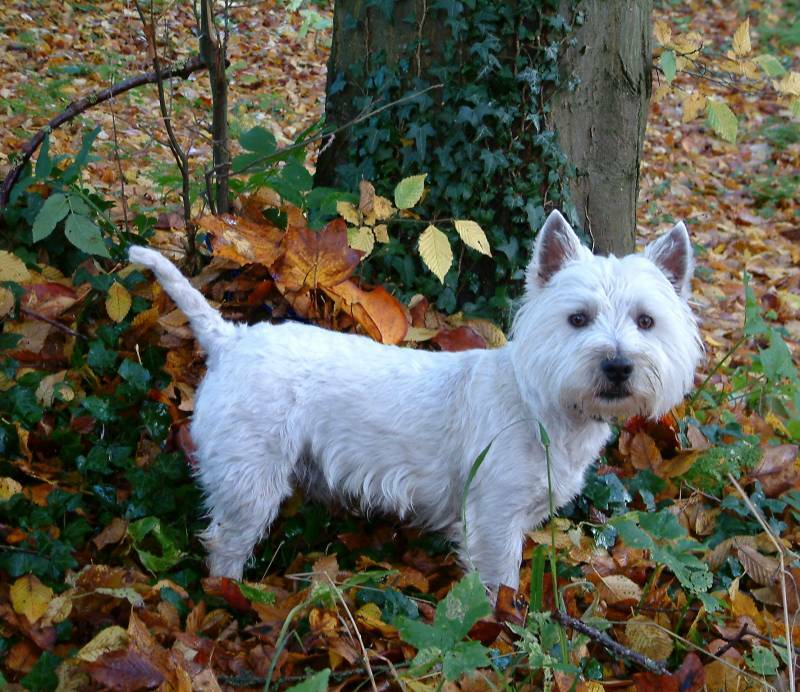 Westies are well known for their predatory instincts – after all, they were bred to hunt. You may have heard of a Westie that co-habited in perfect harmony with one or more cats or even a pet rabbit, but be warned, most can represent a death threat to cats, rodents, rabbits and birds. You will have to consider that your first loyalty is to any existing pet and that it is unkind to introduce another that has the potential to attack and cause them harm. We receive so many enquiries from families with children that we thought we should clarify our position. Westie ReHoming does not have a blanket rejection policy on rehoming where there are children. We prefer to consider each application and situation on its own merits. Children and dogs can be taught mutual respect at a very early age and form a close bond, and occasionally we have a westie that has lived with children and would miss exposure to them. These are of course very much in the minority, many of the dogs come to us because they have had an unpleasant experience with a child and would tend to be on the defensive in the future. In this case, or where compatibility of the dog with children is uncertain we cannot take the risk of rehoming where there is a young child. Therefore when considering rehoming with children we must always take into account temperaments and personalities and ensure that neither the dog nor child could be put in harm’s way. Westie ReHoming is happy to rehome dogs with people of any age provided it is felt that the applicant will be able, over the lifetime of the dog, to provide for all its mental and physical needs. In short, we would request people to be realistic when stipulating the preferred age of the dog, given that the life expectancy of a westie is commonly 15 years, and sometimes more. Older people, as wonderfully kind and nurturing as they may be, and having an abundance of time and companionship to offer, are physically unable to cope with an extremely energetic young dog. As a result the dog becomes quite a handful, and because its needs are not met becomes bored, suffers from a lack of exercise and stimulation and quickly goes out of control. This is when the dog comes into our care by which time it is not easy to place, the original owner not being able to understand that what the dog displays at that age is not ‘naughtiness’ but excess mental and physical energy that needs to be used. Please understand that we see this happen over and over again and we will not put a dog into what we feel is an inappropriate home. 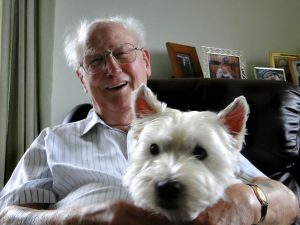 On a very happy note we can report that we have in the past successfully rehomed a lovely little Westie, who at the age of twelve and a half went on to live in a lovely home with a delightful, suitably active couple aged ninety! Westie ReHoming take in lots of ‘golden oldies’, or more mature dogs that are undemanding, companionable and uncomplicated. Most of them are perfectly fit but simply now prefer a more predictable life, home comforts, companionship and plenty of love. They may well have come in through no fault of their own and experiencing bewilderment by a change in their circumstances and having their life turned upside down after all this time. Behavioural problems are usually worst between 6 months and 4 years. Once the dog reaches middle age (around 7 years) the issue has usually been resolved, or they can’t be bothered with jumping up, fighting or finding their own amusement any longer. Don’t forget, Westies don’t usually even start to think about growing up until they reach 7 years or so. We admire people who are willing to take on an older dog because they are ultimately putting the needs of the dog first, and their own needs second. It can be seen as a privilege to care for an older dog, and should be the prime requisite for wanting a rescue dog. So, if you are committed to a dog for life and to giving it security, happiness and love in its later life why not take it out of rescue, and into the warmth of your home and your heart? "When I was looking for a westie I was recommended to go to Westie ReHoming. They asked me to fill in a form which gave them an idea of my lifestyle and selected a lovely little dog, not exactly the kind of westie I was looking for originally, but their judgement proved to be spot on. Hamish is the most perfect little dog for me and we love each other to bits. I wish his first mum and dad could see how happy he is with me now, it must have been so hard for them to have to give him up. I could so easily have made a mistake without the guidance and experience of Westie ReHoming, and I would highly recommend anyone wanting to adopt a westie to give them a call first. I'm sure they won't regret it, Hamish and I certainly didn't"
"I was so pleased to find that Westie ReHoming covered Scotland as I particularly wanted a westie, having grown up with one. They found us Dougal, who is the light of our lives. Everyone was incredibly helpful to us and the volunteer who fostered him was really lovely. She brought him to us so that she could be sure that he would settle in our home. No problems there! We really could not have wished for better service, and are still in touch with Jacqui and Robert who are going to call in sometime when they are up here. What a happy ending for us all"